Tulsi water/holy basil tonic is the best recommended safe home remedy for cold to babies, kids and adults. Tulsi leaves are proven to be natural expectorant that clears chest congestion. Tulsi leaves are recommended for fever too. Tulsi leaves have germicidal, fungicidal & antibiotic properties making it ideal for bacterial, fungal and viral infections. Holy basil has analgesic(pain-killer) and sedative(induces sleep) properties too, making it a complete cold formula. Tulsi plant is a natural air-freshener & disinfectant that purifies surrounding air and fights infections. Tulsi extract also purifies our blood by reducing the pressure and sugar levels in it. You know, tulsi is a natural cancer vaccine !! No wonder why it is called “Queen of Herbs” !! As our custom insists, grow tulsi plant at home and daily go near it to pray or just to water, and tulsi will take care of you. In hindu temples, they offer tulsi water as theertham(holy water) and whether god will bless u or not is still arguable, but that medicinal tulsi water will bless ur body and keep you healthy!! 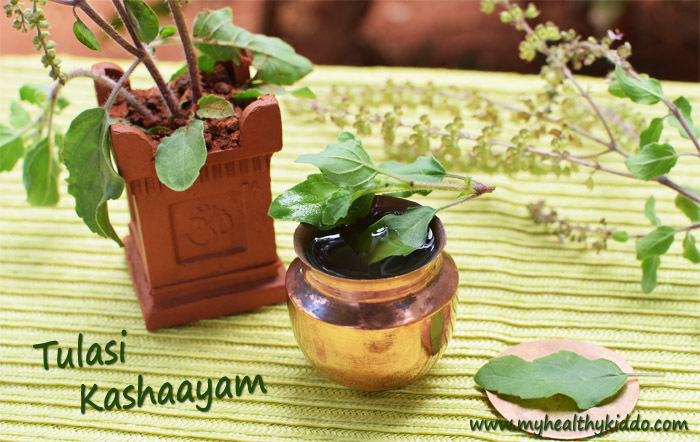 Take few tulsi leaves and wash it well in a bowl of water. In a pan, add washed tulsi leaves and half cup water. Add few panangalkandu/palm candy crystals or powder for sweetness and this is optional, but it is good for cold. Let it boil in medium heat for 5 mins or until halved. Strain thru a filter and squeeze the leaves to extract till last drop. 1.Do not add sweetener for babies below one year. 2.Make just when you want and drink fresh. Do not store or reheat. 3.Fresh tulsi leaves can be replaced by dried powder. But, wherever possible, use fresh tulasi leaves for good results. 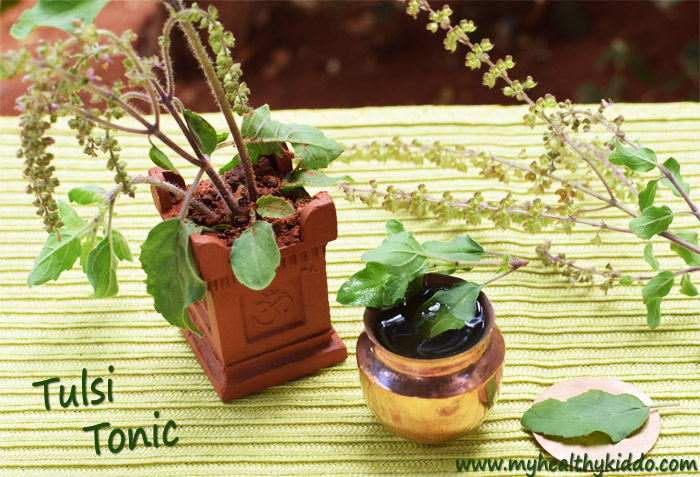 Preparation – How to make tulsi water? 1.Take few tulsi leaves and wash it well in a bowl of water. In a pan, add washed tulsi leaves and half cup drinking water. 2.Add few panangalkandu/palm candy crystals or powder for sweetness and this is optional, but it is good for cold. Let it boil in medium heat for 5 mins or until halved. 3.Strain thru a filter and squeeze the leaves to extract till last drop. Tulsi water is ready. Feed or drink warm..
Do not add sweetener for babies below one year. Make just when you want and drink fresh. Do not store or reheat. Fresh tulsi leaves can be replaced by dried powder. 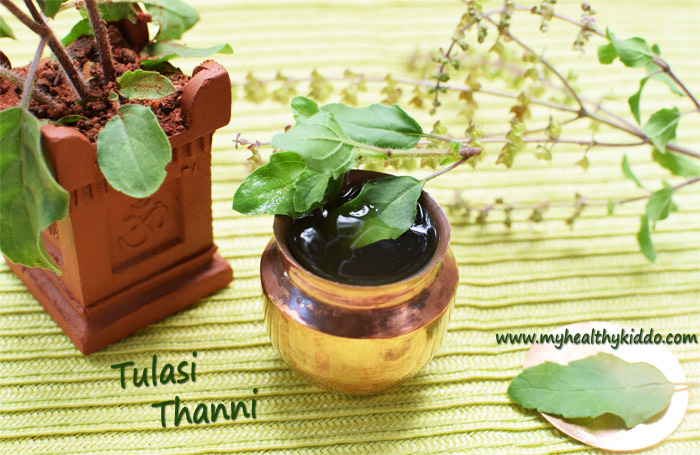 But, wherever possible, use fresh tulasi leaves for good results.